Around 1750 the Manor, and with it The Key, changed hands, passing from the descendants of the Grenville family to John Cleveland of Tapley, the grandson of John Davie. New ownership often brought new investment, so it is of interest to find it said that in 1758 the Lord of the Manor extend the quay southward toward the bridge. It has been assumed that this was the western quay, but that work had already been completed in 1716. A more pragmatic explanation would be that this reference is to an extension of The Key that stood in front of Davie’s house, extending it southward to link, or merge, it with Mr Doubty’s Key. 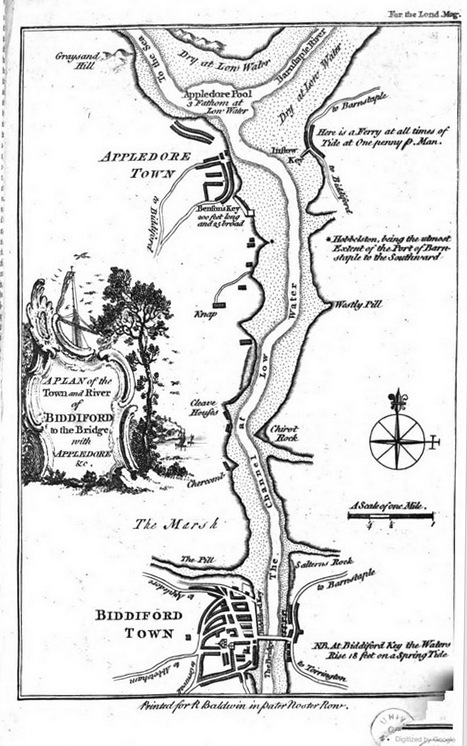 In 1754 the Gentleman’s Magazine published a plan of the Torridge downstream of the Bridge, in which the main channel of the river is shown veering eastward as it passes under the bridge to flow near The Key, with Mr Strange’s Key and the Established Key bounded by shallower water. This suggests that the river’s main channel was still following the eastern course it adopted at some point between 1717 and 1722. A painting, dated 1760, by a Mr Jewell, shows the western quay extending to the bridge and backed by buildings. In 1792 Watkins mentions that the Lord of the Manor was flouting the quay regulations, thus confirming that he still had a quay in his possession. A map of the Hartland region, produced in 1804 and held in the British Museum, clearly shows the main channel of the river passing under the eastern end of the bridge, with a narrower, subsidiary channel, created by diverting the Potters Pill southward, running beside the western quay. The 1809 1st Series 1-63360 Ordnance Survey map shows the main channel of the Torridge running under the eastern end of the bridge, before then veering away from that bank to run centrally between the shores. A narrow legacy channel seems to run alongside the western keys. A map from 1820 shows the Torridge with its main channel running under the eastern end of the bridge but then veering westward, away from the eastern bank.